We went blueberry picking this past weekend and I am glad we did because we are so busy the next few weeks that I fear it may be the only time we were able to go. I just love blueberry picking (and any type of fruit picking for that matter) so much. It inspires to be be a better gardener...and that never really happens. But, back to blueberry picking. Everything was fine until Isla took about her first three steps and started complaining of getting dirt in her shoes. After dealing with that for five minutes, I offered to get her sandals out of the car. We changed her shoes and, of course, that did nothing to help the situation. And she couldn't sit on the ground because it was hot and blah, blah, blah. After so much complaining in such a small time period and her begging to be in the stroller, I finally obliged and put Callum in a carrier. Thankfully that quelched most of the drama. I say most because then, of course, Isla needed me to push the stroller from bush to bush, at her demand, so she too could pick blueberries. Next time I may just have her wear her rain boots and sweat it out! The place we go blueberry picking really is a destination, with plenty of other things to do. Isla happened upon a bunch of rolly pollies that kept her entertained for a while. And we managed to find a bush covered in butterflies. It was so cool. We got to see so many different ones. And Connor managed to touch one, which was hysterical because I don't know if I've ever seen him move so fast in his life. All in all, once we got past the first 10 minutes of drama, it was a pretty dang good time. 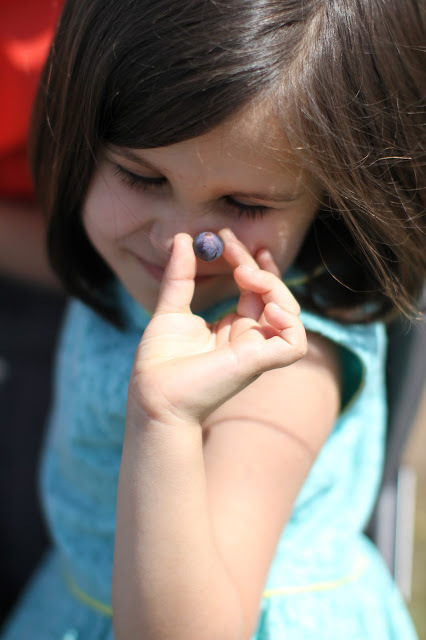 And, just in case you are like me, here are some of our blueberry picking adventures from years past - 2015, 2014, 2013, and 2012...and some strawberry picking in 2010 in Scotland. I can't believe how old Connor looks. Especially compared to every other year. And I love that you have done this every year. By going back and reading all of the blogs about it I could see how much you really do love it. I love that You know how to really enjoy some of the simple things in life. I really appreciate that about you!! https://youtu.be/xRhneUn5-hE I finally had some time and made this video!!! I hope I'm still allowed to make videos for your sweet little ones!! I had so much fun using their pictures and I just really liked the song and thought it'd fit super nicely and it did :) Hope you enjoy watching it as much as I enjoyed making it!! XO sending love and big hugs your way! !